What is your favourite of all your books? Why do your books have so many covers? How many more books are you going to write? What advice do you have for anyone who wants to be a writer? Where do you get your ideas? Well, I wish I could just go to a store and buy one! I never get ideas when I try to think of one - I get them at inconvenient times, such as when I'm driving the car or walking the dogs or in the middle of the night - this is why I always carry a notebook to write them down in. Like most writers, my stories are a mixture of my own life, especially as a child, things I've observed, and things I've heard or read about. How do you go about writing a book? First I get the idea, which grows and grows until it insists on being the next book! Then I start to make notes. I write down names and short descriptions of the characters, notes on the setting, and do lots and lots of research on the time period if it's an historical novel. I also write down a few ideas about the situation and possible plot. This makes me feel very organized, but actually I'm not. Once I begin the first draft I don't look at my notes at all and the book may be completely different from my notes. I never make an outline before I start, because I don't know the plot until I finish the first draft - I find out what it is by writing it. The first draft is truly awful! The characters are thin, the plot weak, and the book is far too short. But at least I have the essence of the story down. Then I read the draft, all my notes, and finally make an outline, which is really blank pages for each chapter with notes in them. Because I never go backwards - I write each draft from the beginning to the end - this "outline" helps if I think of something i want in, say, chapter four, when I'm on chapter sixteen. I do about four or five drafts, improving the characters and plot each time. It's not until the last few drafts that I work on the words, honing each sentence until it sounds just right. This is when I try to make my writing as clear and alive and truthful as I can. How long does it take you to write a book? Longer and longer! It used to take me about a year, but the older I get the more my busy life seems to interrupt my writing. Or else I'm just getting lazier! What is your favourite of all your books? This is so hard to answer - I'm so close to my books that it's impossible for me to judge them. However, if I had to pick only one to be remembered by, I'd pick The Sky is Falling. This is partly because it was such a challenge - I did tons of research and it was so hard to turn all those facts into fiction that I'm amazed and proud that it worked. Also, I became more immersed in the story and characters than in any other of my books. Who are your favourite authors? I have so many! Jane Austen, Jane Gardam, Anne Tyler and E.M. Forster are a few of my favourite writers for adults; Arthur Ransome, E.Nesbit, Hilary McKay and Kevin Crossley-Holland are a few of my favourite children's authors. Why do your books have so many covers? Sometimes a publisher in another country will use the Canadian cover - this happens in the U.S., for example - but usually they like to have their own covers, probably to better reflect that country's culture and book style. What do you like best about writing? The fact that I can make a living by making things up! Also that I work for myself, which makes me feel very free. What I like most of all is meeting and hearing from my readers. It's always a thrill when they tell me how they have been affected by my books. What do you like least? All the practical things that I'm not very good at, such as GST and income tax and keeping accounts. How many more books are you going to write? All I know is that I want to write until I drop! It's wonderful that I never have to retire from being a writer - I have so many ideas for books that I'll never be able to get them all written. Do you have any pets? I have always had a dog in my life and almost every novel has a dog in it. 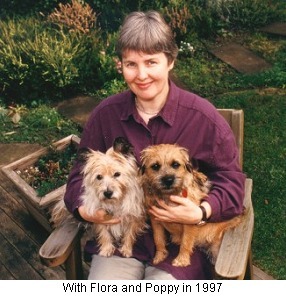 The first dog I got as adult was a very stubborn cairn terrier called Flora. She lived to be eighteen! Poppy, my second dog, died at age fifteen. She was so obedient that she won the cup at the Mayne Island dog show! However, she was the greediest dog I’ve ever known. For a few years I had Cobi, my parents' cocker/bichon. He was an old rascal, but very loveable. 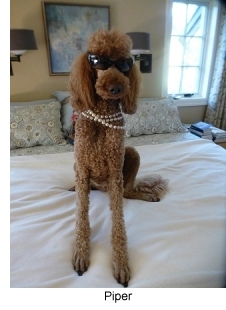 Our current dog is Piper, an elegant red standard poodle. She loves to dress up. What advice do you have for anyone who wants to be a writer? Read, read and read! The more you read, the more natural writing will be for you. Enjoy what you write and don't worry about whether it's good or complete. Keeping a journal - not the kind where you write every day, but the kind where you write what you want, when you want - is great practice. If you're serious you'll have to learn grammar and punctuation. Two books I highly recommend for this are THE ELEMENTS OF STYLE and EATS, SHOOTS AND LEAVES.